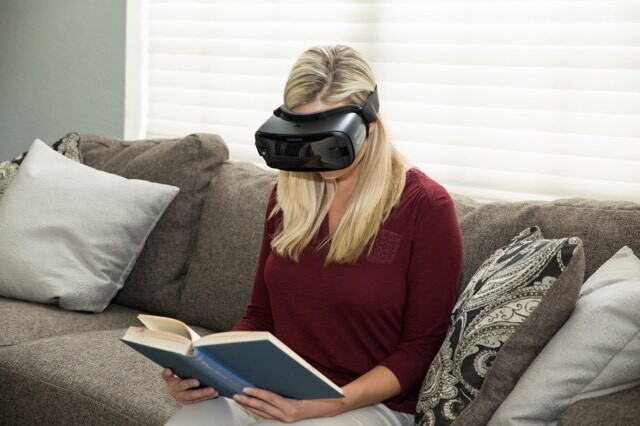 The Patriot ViewPoint uses virtual reality to wrap an extraordinary image around your vision so you can read in a high contrast video magnifier mode, or you can have documents read aloud with the extremely accurate OCR/Text to Speech. Unlike other wearable magnifiers, the ViewPoint offers a wider viewing area which falls more in line with the visual field of patients with Macular Degeneration. Whether you are wanting to read, watch TV or sit outside and enjoy the view, the ViewPoint is comfortable to wear and easy to use. LOVE THIS DEVICE VERY MUCH. IT IS BY FAR THE BEST DEVICE I HAVE SEEN SINCE MY BLINDNESS OVER 47 YEARS. I use these to read normal size sheet music. What’s with the small print for this review section. The glasses work great. I am very happy with them. They work so well.